Former British Prime Minister Tony Blair is visiting Sierra Leone to promote its tourism potential. Mr Blair's office said Sierra Leone was being recognised as an "emerging destination" for tourists. It boasts miles of unspoilt beaches along its Atlantic coast but many potential tourists may be put off by images of its long, brutal civil war. Mr Blair became a hero in Sierra Leone after sending UK troops there in 2000 and was made a local paramount chief. The British soldiers played a decisive role in preventing rebels from seizing the capital, Freetown. The Revolutionary United Front rebels were notorious for chopping off the limbs of civilians with machetes. 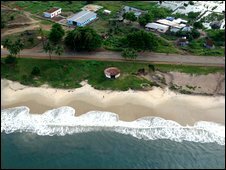 But Sierra Leone is now slowly recovering from the conflict and hopes to copy its neighbour Gambia as a tourist destination. On a two-day visit, Mr Blair will also meet President Ernest Koroma and review his own Africa Governance Initiative. Last year, after a request from Mr Koroma, Mr Blair established a team of nine experts in Freetown to help improve central government and attract private investment. The visit is Mr Blair's fourth to Sierra Leone. He toured in February 2002 shortly after the end of the civil war; in May 2007 on his farewell tour at the end of his term as prime minister; and in June 2008. 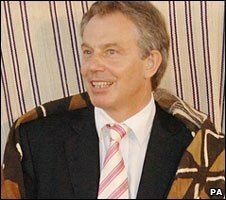 What is Blair's African legacy?